Cross is a self loading stretcher with variable heights designed to develop the concept of operator-stretcher- patient. This allows the operator to feel the stretcher as his partner and not just as a device and the patient to feel psychologically positive and relaxed. The frame, modelled to permit more comfortable assistance and welded using specially designed dies, will not rust and does not require constant maintenance. 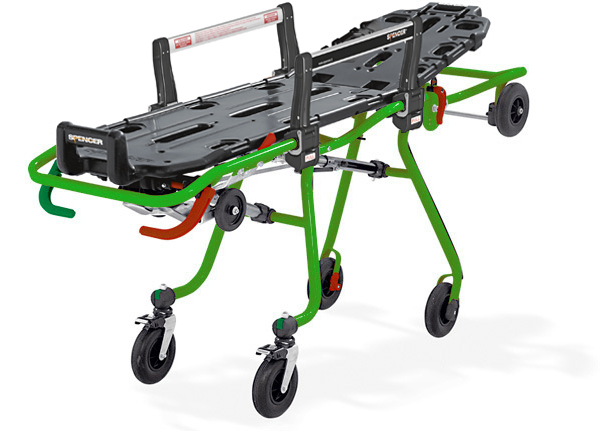 The shortening of the back guarantees the manoeuvrability in confined spaces, turning both downwards and upwards. In addition the evolved geometry and the welded chassis confer absolute stability to the Cross. Cross is the first stretcher in the world with suspension. With the patented SCS (Spencer Compliance Suspension), the characteristic rigidity and the arched geometry of the legs soften the movements of the wheels on the ground and absorb and damp the bumps from the road surface up to three centimetres above ground level. To know more, please visit the FAQ area. We always try to improve and we continue working on our already top performance products to reach maximum efficiency and quality. So, to answer our customers requests, we have improved the loading capacity of the Cross, by increasing the diameter of both the front and the rear legs. Thanks to this we are now able to load 250 kg [551 lbs] maintaining exactly the same dynamics . This is how Crossover was born under the same roof as Cross. 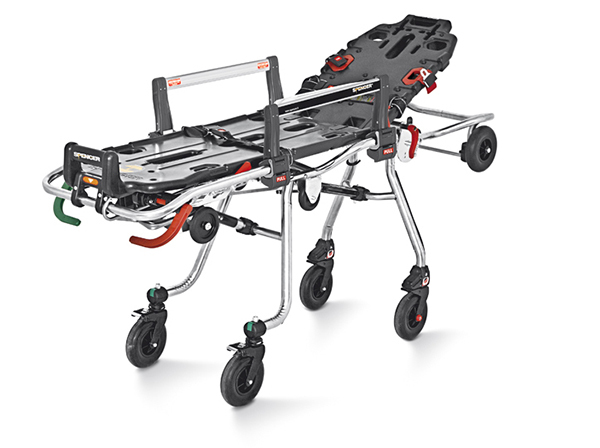 The typically curved design of the Cross and the chromed frame give it its elegance while the front pivoting wheels thanks to the twist system are able to amplify the already incredible manoeuvrability of this stretcher making it both elegant and powerful. The different heights mean that there's no back strain to shift patients. Bumps and vibrations are absorbed by the suspension system and not by my body. An ambulance with a Cross is a completely different story. During rescue operations, every second is vital. The manoeuvrability of the Cross helps gain precious seconds. I'm a rescuer, but this time I ended up on the stretcher myself. My colleagues came to my rescue. I now understand what it feels like and I am very happy that our group has chosen to use Cross stretchers. Just the best stretcher in the world for quality / price. We now have more than 100 ambulances equipped with Cross. With just one movement the side bars lower and turn to hidden storage position which makes work easier. When they moved me from the bed to the stretcher I didn't get the bump in the back like other times. The 10G hook is easily installed and can be used with all the Spencer certified self loading stretchers. No comparison with manoeuvrability: even with patients weighing more than 100 kg [220 lbs] I can move the stretcher without any effort. For us obese even the easiest of movements can be a huge effort. When I got onto the stretcher I thought “now it's going to collapse!” but even though it did not look so strong it certainly was! We've been working with the Cross for years. Once the customers have tried working with a stretcher with suspension system they just can't do without it.